Home > Blog > Almost There! I can’t believe after two years since getting this idea to paddle down the Murray River, training over the last year stroke, after stroke, blisters and aching arms up and down the Yarra River, in the heat, cold, wet and sunshine I can’t believe it is about to happen. At times it just seemed like a fantasy, until now. This last week has been so hectic, organising and picking up equipment, more planning and refinement, a sick wife, feelings with a tinge of aniexty as I look at the weather; it’s going to be a very hot week! The starting team has now arrived, Brian, Roberta, Paul, Tony, Chris and Tiy. We have been doing the final preparations and tweeking of equipment for an early start tomorrow morning. As I write this I can hear the guys in the background modifying the cover for the tinnie to keep our gear dry, Brian and Roberta preparing the dinner. They are getting on with what needs to be done. 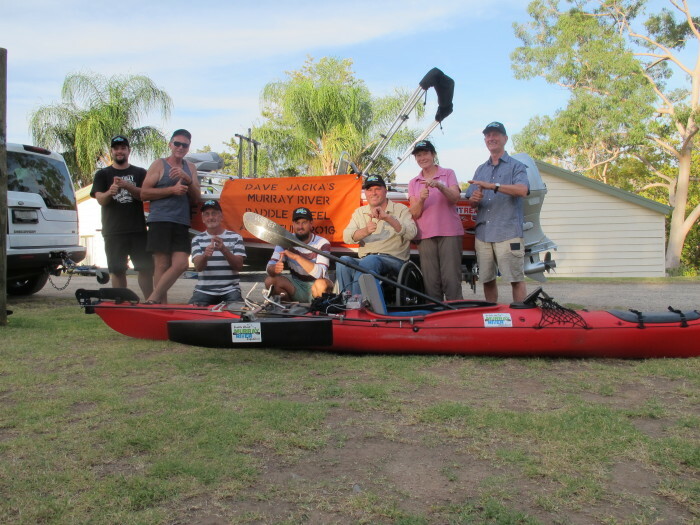 I have a fantastic group of people with me and if I can eventually make it to the end of the Murray River in 3 months time, it will be because of the many involved. With the temperature edging to 36 degrees tomorrow, it wont be a long day paddling. Wishing you all a safe and exciting paddle. Best of luck to you all. Very inspiring, shows us all that persistence, courage and believing in yourself anything is possible. Of course people that believe in you and support you is part of your achievements what ever they are. Most of all enjoy your adventure. ?? So, the first day of your next venture. Again you inspire us Dave and remind us all of our ability to just find a way to get things done. Your team is there because of you and your amazing vitality and zest for life. Sending best wishes to you all for a safe and enjoyable journey down the Murray. Take care as you head off in the hot weather.